The Stance+ Street ride height adjustable Coilover suspension kits have been engineered and built to a very high standard. The units are made from Steel and powder coated Black to help weather protection. The kits are made exclusively for Stance+ and are meticulously inspected throughout the build process ensuring you get the very best quality suspension possible. Each Coilover has been designed to ride firmer than the factory fitted suspension. The dampers are oil filled and are approximately 25%-30% stiffer, giving a firm yet forgiving ride quality. The springs are powder coated and the kits also benefits from built in bump stops, helper springs and shorter piston rods which also help provide a smoother ride. Each Stance+ Street Coilover kit is fully height adjustable by the millimetre. Our kits will lower from 30mm-80mm (most applications). Not only will the car be lower but it will also handle a lot better than the standard O. Your car will corner flatter and feel more predictable through fast sweeping bends. With the reduction in body roll the car will change direction quicker and feel far more agile and responsive. The Stance+ Street Coilovers have been designed for road use but they can be used for occasional track days. The ride height setting is down to you. Set the car up with a moderate drop for fast road or wind them down super low for urban cruising, the choice is yours. Stock availability is great and the application list is huge with more kits being added on a regular basis. For safety reasons we strongly advise that all our kits are fitted by a qualified vehicle mechanic or trained vehicle technician. Height adjustable from 30-80mm (most applications). 25-30% up-rated shock absorber damping. FUCHS oil filled dampers fore superior ride quality and performance. FUCHS damper oil is used for maximum lubricity and consistent damping. Short, heavy duty hardened chrome piston rods. Firm yet comfortable ride quality, suitable for fast road or mild track day use. Coilover springs are high tensile, chrome silicon steel, shot peened for strength. Coilover springs are powder coated for weather protection. Helper springs are used (where necessary) to prevent spring dislocation when car is jacked up. Built in Elastomer bump stops for durability. Dual locking rings (most applications) anodised for weather protection. Powder coated Anti-Corrosion coilover bodies. We are dedicated to ensuring the highest possible quality service to our customers. One of our sales team will be on hand to help you as soon as possible. 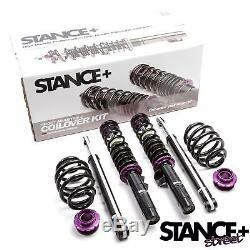 The item "Stance+ Street Coilovers Suspension Kit BMW 3 Series E46 Saloon/Coupe 2WD 98-05" is in sale since Thursday, December 14, 2017. This item is in the category "Vehicle Parts & Accessories\Car Tuning & Styling\Performance Suspension\Other Performance Suspension". The seller is "gnj_automotive" and is located in Accrington, Lancashire. This item can be shipped to North, South, or Latin America, all countries in Europe, all countries in continental Asia, Australia.